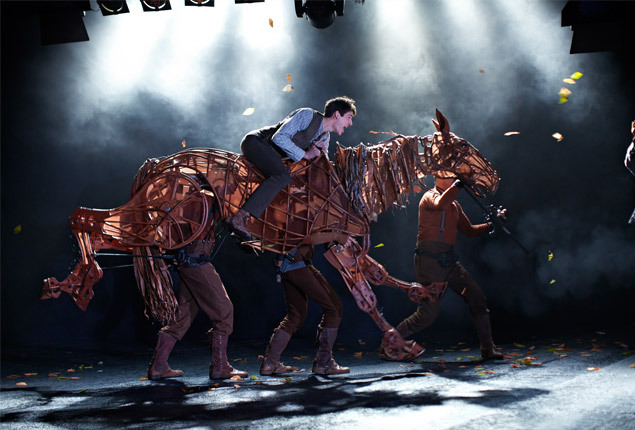 Making War Horse is the story of how Michael Morpurgo's children's novel became one of the most popular and acclaimed productions in the National Theatre's history. Rhode Island PBS presents the film on Wednesday, May 29 at 10 p.m., with encore broadcast on Sunday, June 2 at 7 p.m.
From its early development in the National Theatre Studio, see how Handspring Puppet Company created the groundbreaking techniques that brought a lifelike horse to the stage. 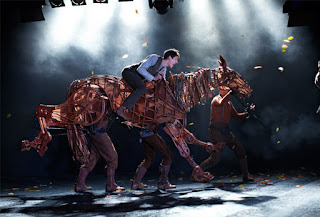 Behind the scenes and into the rehearsal room, featuring interviews with the cast and creative team, Making War Horse documents this unique theatrical collaboration and the creation of a stage classic. The stage production is coming to the Providence Performing Arts Center, and Rhode Island PBS has tickets for the opening night performance on June 5. Saturday night, May 25 at 7:30 p.m., Rhode Island PBS presents Maple Syrup in Rhode Island, as part of its ongoing series, Rhode Island Stories. The 2013 SENE award winner for Best Regional Documentary, Maple Syrup in Rhode Island tells the story of Bill Livingston, who has been making maple syrup for close to 50 years. Bill explains the maple syrup process from tapping the trees to bottling the syrup. How Do You Love An Elephant? 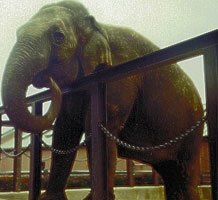 tells the story of Fanny, the Asian pachyderm who lived in Pawtucket's Slater Park Zoo for 35 years. She was loved by the residents of the city, and most would be horrified to realize she was unintentionally mistreated during most of her stay. When the city faced severe financial hardship in 1993 and had to close its zoo, the controversy came to a head as those who had grown up with Fanny and those who could see she was suffering battled to determine her fate. This film recounts the events that led up to the need to have Fanny moved, and the controversy that ensued between the people who fought to keep her and the people who fought to move her. Through archival footage and interviews, the film conveys the love people felt for this gentle animal. about humane treatment of exotic animals, giving the audience an opportunity to reflect and compare Fanny's experience with that of elephants currently in captivity. WSBE Rhode Island PBS will air How Do You Love An Elephant? on Saturday, May 25 at 7 p.m., as part of Rhode Island Stories, its continuing series of local documentaries featuring Rhode Island people, places, events... or animals. Rhode Island Classroom explores the latest technology, lessons, and personnel who are making the grade in Rhode Island Kindergarten through grade 12 classrooms. The new 30-minute quarterly series, hosted by Margie O'Brien and produced by WSBE Rhode Island PBS, premieres Thursday, May 23 at 8 p.m., with rebroadcast Saturday, May 25 at noon. Five independent stories are woven into the first episode, giving viewers insight into programs, projects, and initiatives that are sparking learning excellence in Rhode Island classrooms. 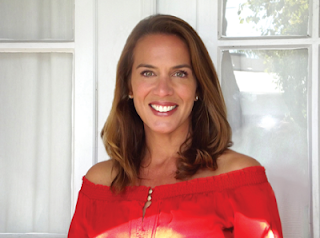 "I’m excited to be part of Rhode Island Classroom," said host Margie O'Brien. "It gives me an opportunity to profile the best programs and teachers in Rhode Island." One of those programs is a statewide mentoring initiative aimed at empowering first-year teachers. The Rhode Island Classroom segment features a seasoned educator using his experience and enthusiasm to help elevate first year teachers from a status of 'good' to 'excellent' at a faster pace. O'Brien also sits down with Education Commissioner Deborah Gist. Back to work after a life-threatening prognosis, Gist is ready to transform education here in the Ocean State. With critics fighting her every move, Gist is moving forward with standardized tests, teacher evaluations, and even pushing for full day Kindergarten. Imagine the stimulating conversation 100 educators could create if they were able to chat for an hour? It's happening, weekly, thanks to social media and technology. Every Sunday night, EDChatRI, a Twitter site, allows teachers, administrators – even students – to discuss pertinent lessons and policies. Rhode Island Classroom introduces the faces behind the Tweets. O'Brien said viewers will be dumbfounded over how students at Community Prep solve math problems. The Calculator Club, founded by Dan Corley, challenges students to solve problems in their heads before the calculator gets the answer. Rounding out the first show is a visit to a school where the lines are blurred between the stereotypical cliques of nerds, jocks, geeks, and popular kids. Rhode Island Classroom shows what appearing in a school play can do for the acceptance and confidence levels of a high schooler. Future episodes of Rhode Island Classroom will explore new programs, people, and policies that are improving education. WSBE Rhode Island PBS transmits standard-definition (SD) and high-definition (HD) programming over the air on digital 36.1; on Rhode Island cable services: Cox 08 / 1008HD, Verizon FiOS 08 / 508HD, Full Channel 08; on Massachusetts cable services: Comcast 819HD, Verizon 18 / 518HD; on satellite: DirecTV 36 / 3128HD, Dish Network 7776. WSBE Learn transmits over the air on digital 36.2; on cable: Cox 808, Verizon 478, Full Channel 89, Comcast 294 or 312. Margie O'Brien is a proven communications professional. She has worked as a news reporter and anchor in both the Providence and Boston markets for 16 years. She has hosted TV shows, been a political campaign spokesperson, and served the communications coordinator for a Rhode Island-based non-profit. Margie is active with McCauley House, as well as serving as a volunteer coach with the YMCA and local Recreation Department. Ms. O'Brien received a Bachelor’s degree from St. Anselm College and a Masters Degree in Communications / Broadcast Journalism from Emerson College. Margie lives in Barrington with her husband, three children, and golden retriever, Callie. WSBE Rhode Island PBS is operated by the Rhode Island PBS Foundation, a non-profit 501(c)(3) organization, established in 1987 as a public charity to raise funds and provide support services for Rhode Island’s public television station. WSBE-DT is a viewer-supported member of the PBS system of public broadcasting stations, and transmits on two channels: Rhode Island PBS (digital 36.1) and Learn (digital 36.2). Committed to lifelong learning since 1967, WSBE Rhode Island PBS uses the power of noncommercial media to educate, engage, enrich, inspire, and entertain viewers of all ages in Rhode Island, southeastern Massachusetts, and eastern Connecticut. For more information about the programs and services at WSBE, visit www.ripbs.org. In a new partnership with The Hummel Report, Rhode Island PBS will air Hummel Spotlight stories, long-form video profiles that focus on people and organizations making a difference in the community. The first Hummel Spotlight debuts May 14 at 9:22 p.m.
"There’s a natural affinity between Hummel Spotlight and Rhode Island PBS," said David W. Piccerelli, president of WSBE Rhode Island PBS. "These are local stories about meaningful work that doesn't often get noticed. That’s what we do - give voice to those who might not otherwise be heard. Jim brings depth and insight to Hummel Spotlight profiles, and Rhode Island PBS is the right place for that kind of storytelling." In addition to the content, which is key in our decision to air it, another reason it's such a nice fit is our public television format itself. Without commercials to break up and stretch a program to a full 30 or 60 minutes, we often have a block of several minutes at the end of a show. Short films and long-form profiles such as Hummel Spotlight make ideal transitions. The debut Hummel Spotlight is a 7 1/2-minute profile filmed last fall at Sophia Academy in Providence. Sophia Academy is a non-profit all-girls middle school with 60 students, grades 5-8, whose families are living near the poverty-level, many in single-parent households. The story will premiere at 9:22 p.m. on May 14, and rebroadcast on Saturday, May 18 at 7 p.m. (before Rhode Island Stories), with additional repeats at various times during the rest of the week. Although you won't see one every week, new Hummel Spotlights will air on Saturdays at 7 as they come in. Follow our Facebook page for those announcements. For more information about Hummel Spotlight and to find out how you can get involved, visit www.hummelspotlight.org. Here's a link to the story in today's Journal. On June 8, 2011, a wild and freaky wind storm blew through town and uprooted one of two large trees in front of the station building. Fortunately (I guess), the tree fell sideways onto the other tree in the front yard. 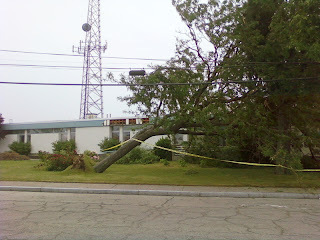 That landing prevented more damage to the building, the power lines, the satellite dish, and other structures and equipment. But both trees had to be removed. For those of you who have not been to the studio, it is located in an industrial park. Since the trees were removed, it been much more industrial than park. With the beautiful canopy gone, the front yard has been rather barren. Until today. 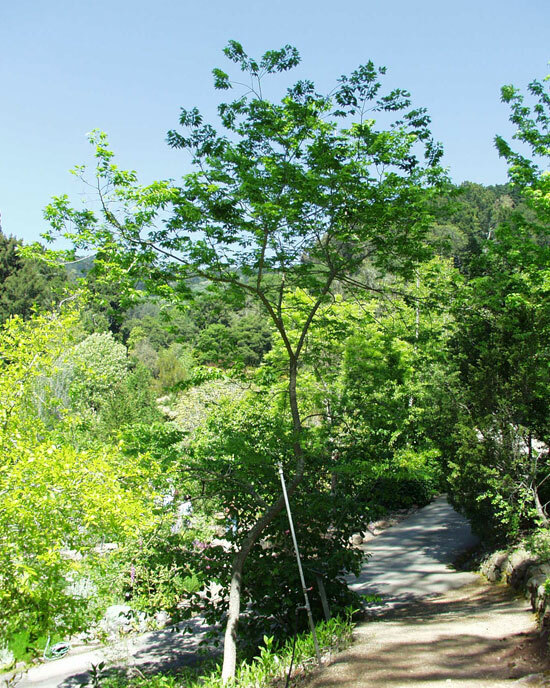 Today, we start on the path toward building a beautiful canopy again. Today, through a program with a number of Providence environmental, beautification, and restoration groups, we planted two new trees in the front yard. The hackberry tree is particularly resilient, making it ideal for use in situations where other trees will not thrive. This is a good city tree, able to take hot, dry winds and drought. On the other hand, it does equally well in moist, cool situations. A tree of simple beauty, the common hackberry is being used more and more widely as a landscape specimen. As a young tree, the hackberry is roughly pyramid-shaped. As it matures, it takes on a vase-shaped profile, with arching branches much like the American elm. In fact, it is commonly used as a replacement for that tree where Dutch elm disease is a problem. It can reach 100 feet in height but usually does not exceed 60 feet in culture. The bark is gray-brown with characteristic corky ridges. The deciduous leaves are elmlike and bright green with toothed edges. They become yellow in the fall. The berries ripen in midfall and vary in color from red to dark purple. The Regent Scholar tree grows 40 to 50 feet in height with a spread of 30 to 40 feet, forming a large, rounded canopy even as a young tree. The canopy appears more uniform and predictable than the species. The dark green, shiny leaves turn yellow before dropping in fall. The very showy, greenish-white to yellow flowers are produced in mid to late summer and provide an airy feel to the tree for several weeks. The young green twigs turn dark grey with age. 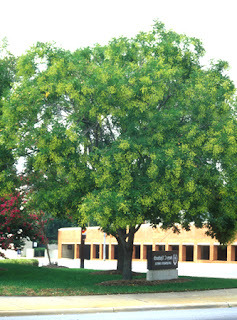 The species tree must be at least 10-years-old to bloom but the cultivar `Regent' blooms at two to eight-years of age.